Our luxurious bathing services are only available in conjunction with a day of daycare or boarding. Sorry... no hair clipping services are available. After some serious play in the morning, your dog will be bathed in a state of the art bathtub. We use a gentle herbal shampoo, conditioner, and warm water. All baths include ear cleaning, nail trimming, a hand blow-dry, and a thorough brush out. 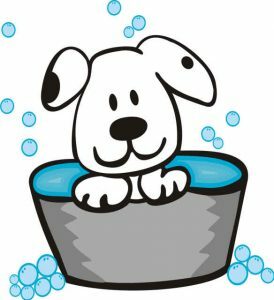 You have the option for private care for ultimate cleanliness after the bath or your dog will then be let out to join the rest of their friends. A final spritz of cologne will be given right before they go home. We highly recommend scheduling a bath after a boarding stay in order to get a clean snuggly dog back home. Let us help you return home with a tired, happy and CLEAN dog! Your dog has been playing his or her heart out and may need some freshening up at the end of the day. When requested, your dog will be wiped down head-to-tail with a moistened washcloth and waterless shampoo. We also offer quick blow-dries for paws that need to be dried. This free service may take around 5 minutes depending on the time of day you pick up. Call ahead with an arrival time and we will do our best to have your dog ready to go!